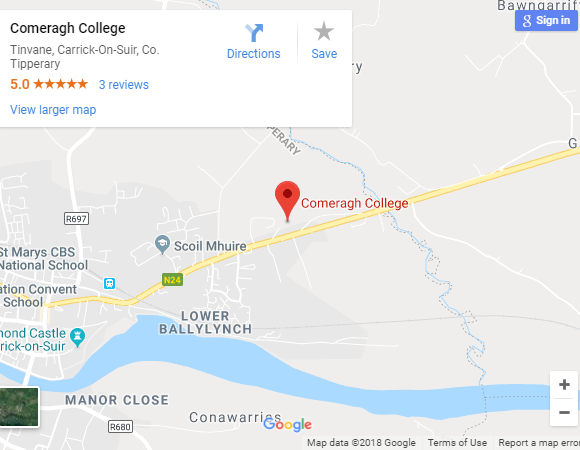 Comeragh College is a co-educational post primary school. Academic excellence is promoted in a caring environment. It has been at the centre of life in Carrick on Suir for almost 90 years. The school aims to provide a high quality education which caters for the diverse skills and aptitudes of our school community. We are committed to the care and development of each individual in a happy and safe school atmosphere which offers children and young adults opportunities to develop as good citizens, proud of their inherited values and beliefs. Our school operates on the premise of due respect for the beliefs of all. Our School is a community where students, staff and parents work together to support each other. The teaching/learning process is the single most important priority at Comeragh College. This is enhanced by a number of factors in place in the school such as; teacher based classrooms, a full suite of ICT facilities in each room (including surface pro 4’s, data projectors, visualizers, etc. ), careful timetabling and an excellent teacher/student dynamic. In addition to the standard ICT equipment for each room, there are four fully functional computer labs, including a mobile lab called a Labcabby( a mobile device which houses/transports/stores/charges 30 laptops). Three science labs, 5 practical rooms, language labs are among some of the specialist rooms in operation since the school opened. Staff at the school are fiercely committed to providing the best opportunities to all students. Comeragh College is also fortunate to have a very strong Parents Association which works closely with the school providing both a voice for parents and a support to the school. The Student Council is another key element in the decision making process at the school with representation from each year group.